Planning a home improvement job? Planting a tree? Installing a fence or deck? Want to avoid spending a day in the dark? Here’s what you need to know first: Dial 8-1-1! Calling 811 before every digging job gets your underground utility lines marked for free, and helps prevent undesired consequences. Dial 811 from anywhere in the country a few days prior to digging, and your call will be routed to your local One Call Center. Tell the operator where you’re planning to dig, what type of work you will be doing and your affected local utilities companies will be notified about your intent to dig. In a few days, they’ll send a locator to mark the approximate location of your underground lines, pipes and cables, so you'll know what’s below - and be able to dig safely. The BLP marks our underground lines within the utility right-of-way. 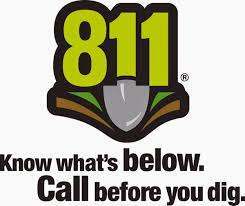 Remember, always call 811 before you start any digging project! You’ll avoid injury, expense, embarrassment - and a very inconvenient day in the dark. your employees from fire and electrical hazards. Clink link to found out more information.